We have today learned that Westminster City Council have had to put the parking enforcement contract they agreed with Mouchel at Christmas time in the bin, after having spent around £200,000 worth of taxpayers’ money on setting up the agreement. Last month, the council announced that the existing contract with NSL Services would not be renewed and Mouchel would be appointed instead to control the council’s parking activities. So Westminster Council’s parking department now has to start from scratch and go through the whole process of tendering the contract again. This comes at a time when the EU Commissioners are investigating the creation and implementation of the Westminster lead Partnerships in Parking (PiP) scheme, whereby other councils are actively encouraged to adopt Westminster’s parking arrangements with the Verrus pay-by-phone parking system, in exchange for a nice and comfortable fee. PiP is accused to blatantly encourage other local authorities throughout London and the rest of the UK to adopt the cashless Verrus system without going through the statutory tendering process, as per the European Union regulations. Alastair Gilchrist, creator of the PiP scheme at Westminster City Council, was scheduled to give a presentation on PiP last week at the ParkEx exhibition in London, but failed to turn up for it, claiming that he was too busy working on other things! UK France Bikers have heard that PiP has been put on hold until further notice, while the EU Commissioners are investigating this potentially illegal scheme. All this fiasco also comes at a time when the No To Bike Parking Tax campaign has lodged an official complaint with the Metropolitan Police against two senior officers employed by Westminster City Council, suspected to have carried out fraudulent activities in awarding a £13 million parking enforcement contract to NSL Services Ltd in 2007 without tender, as required by the European Union legislation. The same No To Bike Parking Tax campaign has also recently lodged a legal case with the High Court of Justice against Westminster City Council for having implemented a motorcycle parking charging scheme with the sole purpose of raising revenue, which is illegal under United Kingdom law. Neil Herron, of Parking Appeals said: “Westminster is supposed to be the flagship parking enforcement authority and yet, once again, we have another blunder. We have seen illegal controlled parking zones, diplomatic bays not compliant and police investigations. 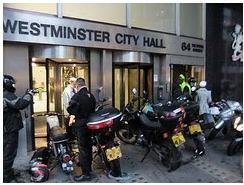 Warren Djanogly, Chairman of No To Bike Parking Tax campaign, said “Clearly, the Police investigation following my complaint about alleged irregularities that led to NSL Ltd performing the Westminster City Council’s [WCC] Parking Enforcement Contracts has sharpened the minds of the legal department. The resultant debacle of scrapping the new contracts award, to my mind, can only add credence to the allegation that the contracts themselves may well have been far from as legally-watertight as WCC and NSL Ltd want the world to believe. Whilst we await an announcement from WCC, should the Police find the allegations warranted and that NSL Ltd should never have been party to the current contracts, serious questions must be levelled at WCC should they choose to now extend the current contracts to NSL Ltd to cover the new tender process”. The ceos of nsl where disgusted and appaled at the fact that westminster gave the conotract back to nsl considering the recent state of affairs. howvere we have a very strong feeling that the tendering process was fixed by nsl to westminster to regain the contract. over the past 2 months the senior management have been setting illegal targets to the ceos for them to p bring in lots of pcns each day even if it means issuing illegal and incorrect tickets.